Nut allergy? No problem. Roasted chickpeas make a great crispy, crunchy topping everyone can enjoy! Place chickpeas on a baking sheet. Drizzle with olive oil and stir to coat. Season to taste with salt and freshly ground black pepper. Roast for approximately 30 minutes, stirring every 10 minutes. The chickpeas are done when they are golden, dry and crispy with a slightly soft center. Let cool thoroughly. Place chickpeas in a food processor and pulse until coarsely ground, scraping the sides and stirring with a spatula if necessary. Transfer to a bowl. Add curry powder, panko, lime zest and cilantro and stir to combine. Adjust seasoning with salt and black pepper if needed. Brush a nonstick baking sheet with olive oil. 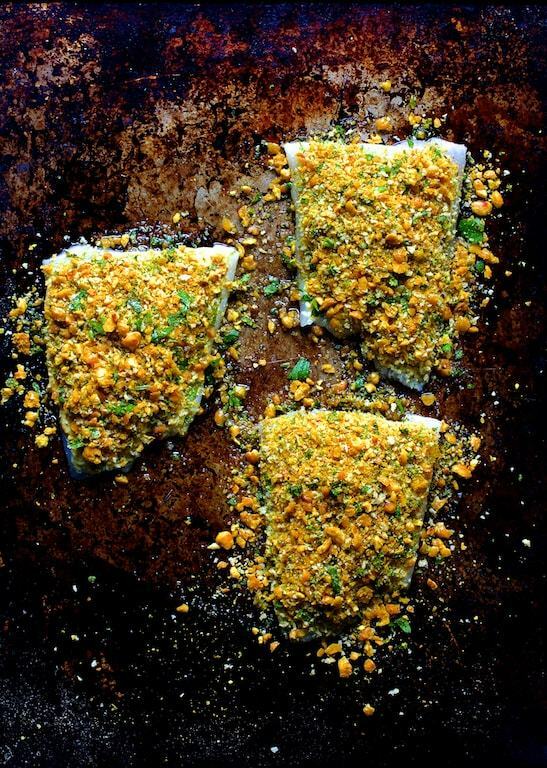 Place Barramundi fillets on the baking sheet and brush the top of the fish with mustard. (If your barramundi fillets are thin on one side, fold it underneath to create a more uniform thickness.) Top the fish with equal amounts of the chickpea topping, pressing slightly to adhere. Spray lightly with cooking spray. Bake for 13-15 minutes at 400 degrees or until cooked through and fish flakes easily with a fork. Serve with tartar sauce. Combine all ingredients in a bowl and mix well. Serve with fish.